This rougui is produced by Sea Dyke and comes in a pretty double lid tin. This tin contains 100g and my tea was produced in 2016. "Zeng Cang' literally meant collection which I guessed it implied this rougui was a 'collector' grade of oolong. This is a new tea offering by Sea Dyke and I was looking forward to this tea. I was impressed with their newer Shui Jin Gui tea which came foil packed in 12.5g and packed individually in small orange boxes. That tea was nice, mellow and smooth. The tea leaves in this rougui tin looked plump and pleasant. I had looked forward to trying this tea. This tea did not meet my expectations. The roast was more medium than high roasted. I suppose Sea Dyke was trying to appeal to both medium roast and high roast tea drinkers with this roast level. I wished this rougui to be higher roasted as the flavours seemed muted in my opinion. 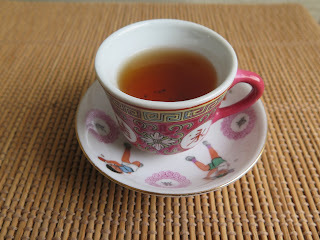 There are many high roasted oolong offerings that I enjoy from Sea Dyke but this rougui is not my cup of tea. Sigh! If you are below 18 years of age, do not read this blog entry. If you think you are young and feel like you are below 18 years of age, do not read this blog entry. This is because of the high alcoholic content in this article. A tea buddy from Yokohama Japan, Mr Sato, emailed me last May. Mr Sato enjoys Chinese tea especially raw and ripe pu erh. He told me to try drinking pu erh tea with alcohol. 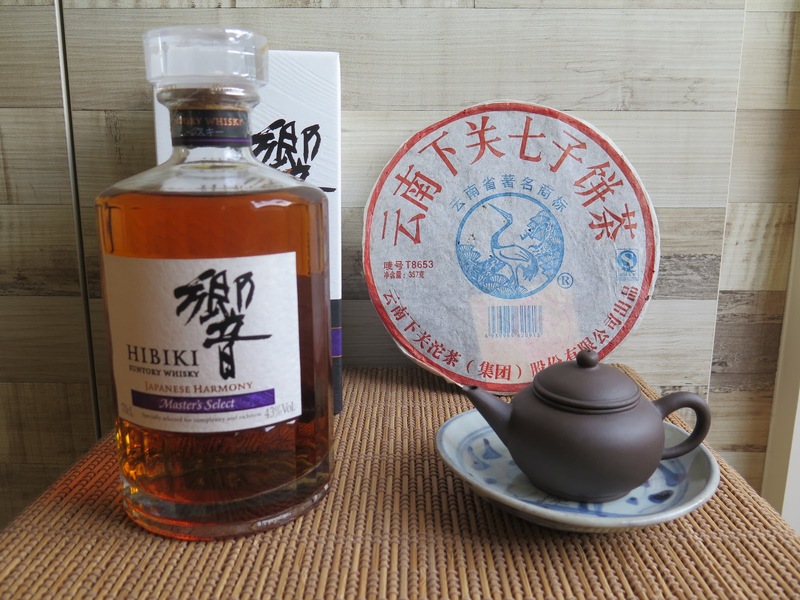 He recommended using whisky, one part whisky and 2-3 parts pu erh. He mentioned to drink it cool. My guess is to drink it when the tea had cooled to room temperature or I had to add ice to the tea or drink. I was excited to try this tea (it has more tea than alcohol anyway). I realized that I had finished my bottle of scotch over last Chinese New Year and will be refilling my alcohol stash when I buy a bottle at the duty free airport during my next oversea trip. I could not wait so I went online to get a bottle. You can buy literally everything now on the Internet. My daughter recently got herself a metal drinking straw with brush which I see as an attempt to be more environmentally conscious. Anyway, I bought a Japanese whisky. I had wanted to try a Japanese one as I had read an article that the Japanese made ones were quite good. So I got a Hibiki Harmony. No age statement on the bottle but I had read reviews that there was good age and maturity in the whisky. 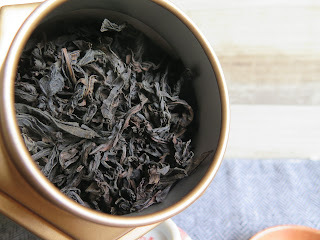 I brewed up a 2006 Xiaguan iron cake, poured out the infusions into cups and and left the tea to cool to room temperature. I used 1 part whisky/2 parts tea and sat down for a drink. Gee......the tea or drink tasted nice. Sweet, spicy, woody and fruity. Very good chi....I think from the alcohol or tea. I had another round, this time with ice. This time, the drink is more minty with a sweeter aftertaste. Xiaguan on steroids. 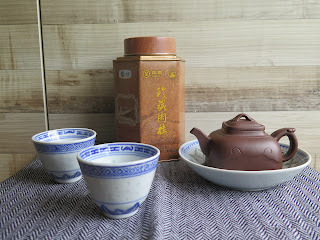 I am going to try, next time, this bottle with ripe pu er and high roasted oolong. I will also experiment adding a few whisky drops to a cup of tea. I will report my findings to my readers. I do not think this bottle will keep till Christmas. But I digress. The Kim-Trump summit is happening here in Singapore on June 12. I hope something meaningful comes out from that meet. A toast to peace. 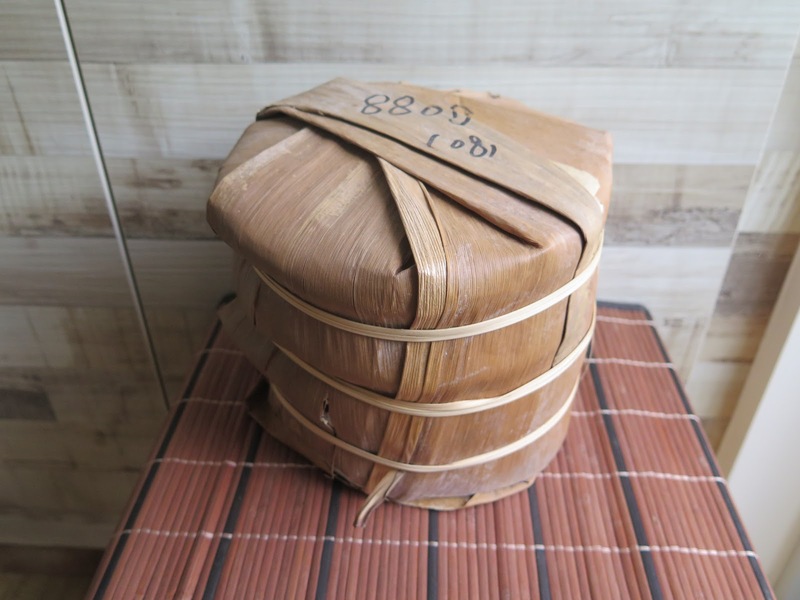 This is my earliest pu erh purchase from my China trips. 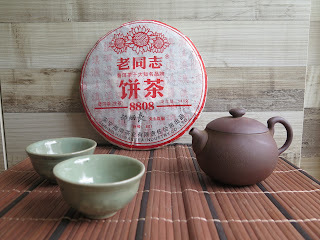 I had purchased this tea during my 1st trip to Kunming back in 2009. 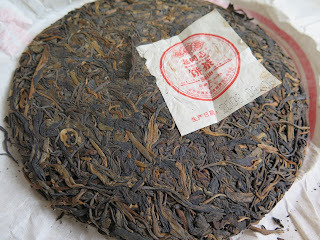 I met a few Kunming tea dealers there including Scott Wilson of Yunnan Sourcing. This 2008 Haiwan 8808 cake was produced by Haiwan tea factory for the Kunming tea markets. 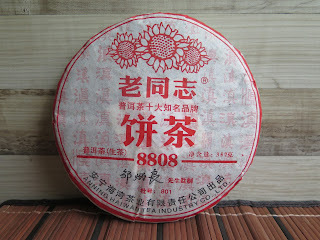 I wanted to bring back some tea home and I managed to lugged a few tongs of pu erh tea which included these 8808 cakes. Last week, I decided to open a tong to check on my storage of this tea. I had stored in an empty bedroom and and left it for more than 9 years. Cake is clean and dry and compression of the cake is high that I need a pu erh pick to open up the tea cake. This tea is woody and herbal. The 'woodiness' seem to remind me of old antique furniture. Good workhorse brewing up 10 strong infusions easily. I am happy the tea is smooth and clean. Pix of tea in cup in the 4th infusion (8g in a 130ml teapot).